Belitsa’s Sanctuary for Ex Dancing Bears near to Bansko. Until 1993, when Bulgaria made the use of bears for entertainment illegal, bear cubs were routinely captured from the wild and torn away from their mothers to be made into “dancing bears.” All for the sake of tradition and human entertainment, these young and frightened bears would be forced to stand on glowing hot iron plates or coal until they’d automatically raise their feet in order to escape the excruciating pain – and this little scene of misery qualified as “dancing,” a spectacle that many bear trainers would use to turn a profit. To further control the bears, trainers would pierce their snouts with giant rings and tie a rope to them. Anytime the bear would move without the permission of their trainer, they would instantly be shocked with pain. Fortunately, given the extreme cruelty of this practice, the government sanctioned a ban and all of the dancing bears were effectively retired in Bulgaria. This meant that many bears were rejected by their former owners and left without anywhere to go if they were no longer profitable. Thankfully, many compassionate and caring individuals stepped up to help these bears in need and give them the life they always deserved – one filled with respect, happiness, and freedom. In 2000, the animal welfare organization Four Paws founded The Belitsa Bear Sanctuary to provide refuge for the former dancing bears who needed help and a home. Located near the town of Belitsa in South West Bulgaria, the Belitsa Bear Sanctuary is home to 27 rescued dancing bears. Covering over 120,000 square meters, it’s one of the largest Four Paws’ bear sanctuaries of its kind in Europe. Plus, it’s supported by the Foundation of Brigitte Bardot. Today the sanctuary is a popular tourist attraction in the country, offering people a rare glimpse of rescued bears in their natural habitat of lush green woods – something you don’t get at your average zoo. It’s also pretty high maintenance, though completely worth every bit of time and effort. “Taking care of the bears includes many things – feeding them three times a day, preparing dens for the ones that cannot do it for themselves, cleaning the pools, providing medical care and much more,” a representative from the sanctuary tells One Green Planet. All the bears at this sanctuary are now living happy, healthy and natural lives thanks to this incredible organization and the amazing people behind it. Most of the bears here have had traumatic pasts and for many, the scars are permanent. Let us introduce you to Lady M, one of the bears living at the park. Although the ban on using bears for entertainment was established in the early nineties, it took until 2007 for all dancing bears to rescued. Lady M was one of the last renaming three. 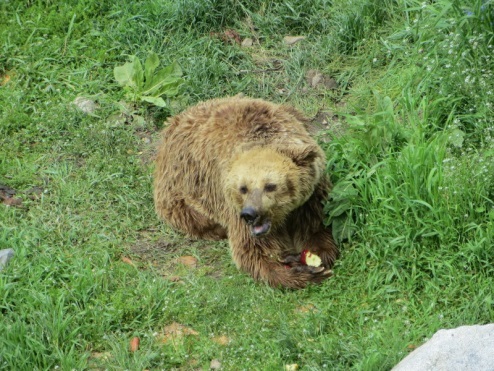 This former dancing bear arrived at the Belitsa Bear Sanctuary in a less than comforting state, several years ago. Blind from years of malnutrition and missing an ear, likely as a result of abuse, she looked far from the stereotypical bear we image seeing in the wild. Nonetheless, she didn’t let her handicaps stop her from doing normal bear things like digging, for instance. Until she arrived at the sanctuary, Lady M had never hibernated, as bears do, due to her unnatural circumstances. However, once she was given the freedom to, she started to exhibit many natural behaviors typical of bears. It’s as if throughout all the pain and suffering she experienced, she never forgot what it was like to be a wild bear. Today, Lady M is a happy and healthy bear, partial to a little sunbathing and an occasional dip in the pool. What more could a bear want?